On April 26, 2013, US Bureau of Economic Analysis released its first estimate of real gross domestic product, GDP. Real gross domestic product -- the output of goods and services produced by labor and property located in the United States -- increased at an annual rate of 2.5 percent in the first quarter of 2013 (that is, from the fourth quarter to the first quarter), according to the "advance" estimate released by the Bureau of Economic Analysis. In the fourth quarter, real GDP increased 0.4 percent. The Bureau emphasized that the first-quarter advance estimate released today is based on source data that are incomplete or subject to further revision by the source agency (see the box on page 3 and "Comparisons of Revisions to GDP" on page 5). The "second" estimate for the first quarter, based on more complete data, will be released on May 30, 2013.
personal consumption expenditures (PCE), private inventory investment, exports, residential investment, and nonresidential fixed investment that were partly offset by negative contributions from federal government spending and state and local government spending. Imports, which are a subtraction in the calculation of GDP, increased. We had a good discussion of this release in my "Investing for the Long Term" Facebook group where many questioned how could ECRI think we are in a recession with 2.5% GDP growth. Lakshman Achuthan You're not alone in thinking our recession call was wrong. Still, the facts are that the GDP release on August 28, 2008 – with the economy eight months inside the Great Recession – revised Q2/08 GDP growth to 3.3% from 1.9%, up from 0.9% in Q1/08. But both of those data points, as well as GDP data for the first two quarters of the 2001 and 1990-91 recessions, were subsequently revised by 2 to 4 percentage points over time. This is how real-time data often behave during recessions. Lakshman Achuthan Hardly any economists recognized the severe 1973-75 recession until almost a year after it started. Indeed, that recession began with the ISM at 68.1, and payroll jobs growth did not turn negative for eight months. Nine months ago we knew that, sitting here today, most people probably would not realize that we are in recession – and we do believe we are in recession. Lakshman Achuthan Just to clarify, a recession is not defined by two successive quarters of negative GDP, rather it's a self-reinforcing downturn in economic activity, when a drop in spending leads to cutbacks in production and thus jobs, triggering a loss of income that spreads across the country and from industry to industry, hurting sales and in turn feeding back into a further drop in production - in effect a vicious cycle. Recession? Or just a slowdown? Some will tell you it doesn't much matter - that it's a distinction without a difference. Nothing could be further from the truth - or as dangerous a delusion. Bull markets do well with many three to five percent corrections. 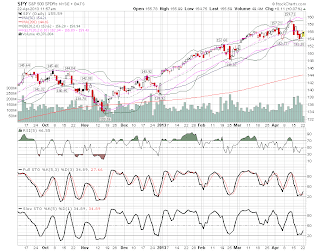 The latest pullback qualifies and this rather complicated chart showing Bollinger Bands and Keltner Channels indicates the market is trying to make another bottom after penetrating its 50 day moving average or MA(50) on my chart. Subscribe now and get the April 2013 issue of "Kirk Lindstrom's Investment Letter" for FREE! 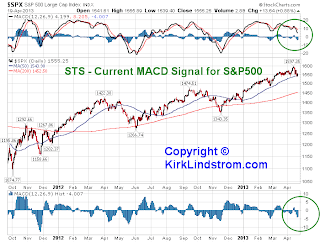 According to Sy Harding, author of Seasonal Timing Strategy™ (STS), "Riding the Bear" and "The Street Smart Report," now is the time to watch the MACD indicator to look for the favorable exit point from the market based on the "Seasons in the Sun Strategy." 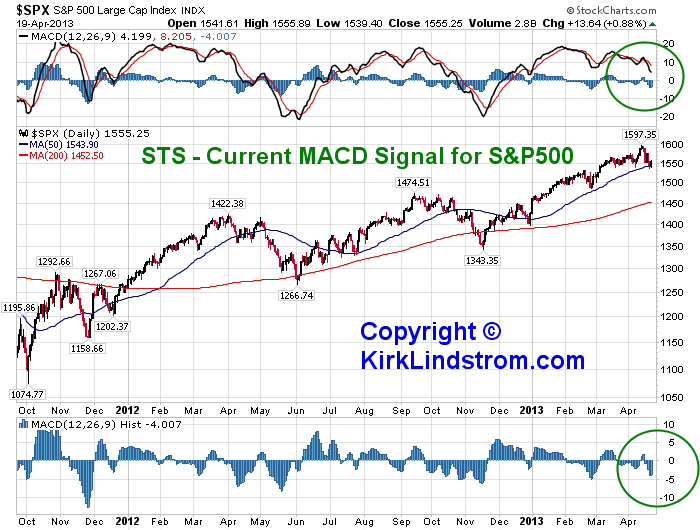 Harding applies the Moving Average Convergence Divergence indicator, or MACD, to the S&P500 after the average best time to leave the market, April 20, following the "sell in May and Go away" strategy. Likewise, around the best days on average to enter the market, October 16, Harding's STS looks for positive MACD to enter the market again. Sy Harding's Book: Beat the Market the Easy Way! Today the DOW and S&P500 are making new all time highs. CNBC had two bulls on who said the markets are not over-valued. Don't miss out! Subscribe now and get the April 2013 issue of "Kirk Lindstrom's Investment Letter" for FREE! "Stocks are at their average valuation when interest rates were five, six or seven percent. Think of them when interest rates are one percent. You really want to own stocks... the only source of income out there. This bull has many more legs that what we've just seen over the last week." Ed Yardeni, a good economist, is more "worried about a meltup." "Fundamentals aren't that bad for the market"
Yardeni isn't a fan or tech or materials but says a case could be made for a secular bull market based on energy and robotics with the latter good for bringing production back to the US but not good for jobs. Yardeni's biggest worry? "worried about a meltup." Both Yardeni and Siegel cited something I've written about for awhile. That is money seeking yield from around the globe will probably find a home in "safer" US stocks that are leading the markets now. Divide your money for one of the core portfolios into 12 or 24 equal amounts. 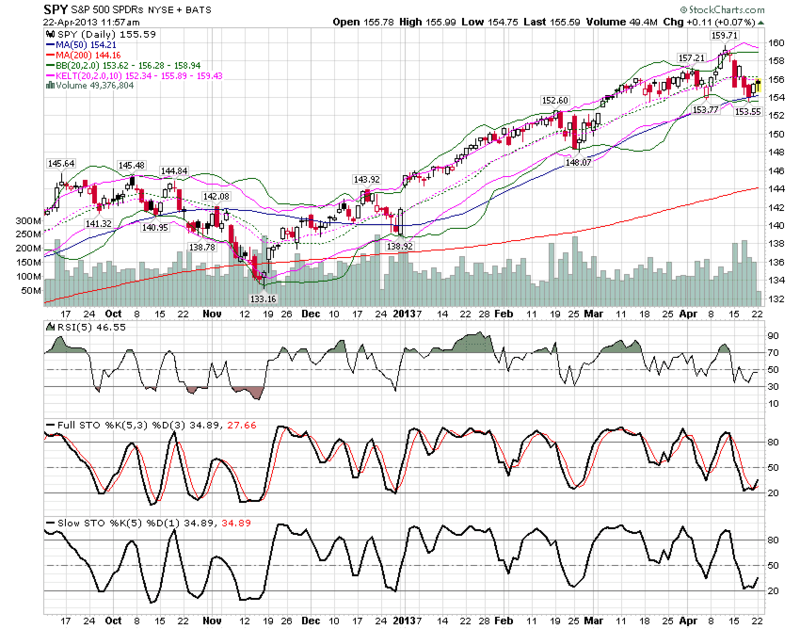 Put one payment in right away into the core mutual funds or ETFs I recommend. In a month on the same day, if the market is flat or higher, put another payment into the same funds. If the market drops another 5%, then make another payment. This way, if the market drops 50% you make 10 payments and get all in with the majority of your funds at a level much closer to the prior lows than today's new high. But... if the market continues higher as many think it will, then you are getting SOME in now and get more in with time. Remember too that ALL my core and explore portfolios have significant cash reserves to take advantage of market declines. Thus even if you get "fully invested" at a market top, such as with a lump sum today, my portfolios have reserves to take advantage of any unexpected bear markets. Don't miss out! Don't Delay! Subscribe now and get the April 2013 issue of "Kirk Lindstrom's Investment Letter" for FREE!